Expanding your company globally can be a daunting task, leaving you to feel overwhelmed and dubious. In the same manner, dating can leave you with the same feelings. Just as there are a lot of options in dating partners, there are a lot of opportunities for business growth. But how do you know who to date and where to go with your date? Together, the two tasks can have remarkable similarities that will have you facing your fears and ready to conquer all relationships – personally and professionally! 1. Market yourself properly. Be honest on who you are – don’t lie. Don’t allow your date to utter the phrase, “You don’t look like your photo online.” Furthermore, do a proper assessment of what you do and do not know regarding your work. Understanding where you have gaps in the new territory is a good step to expansion. 2. No bad-mouthing your ex. No one wants to hear you bash your ex (even if they deserve it). Save the male bashing for your group of girlfriends – they’ll enjoy it much more. Apply the same rule to the international market and don’t talk negatively about your clients or business partners. Your date and/or new client will wonder if you’re also defaming them behind their back. 3. Don’t be selfish. It’s not all about you; listen to what the other person has to say. Ever had to sit through a meal where your date only talked about themself? Ask questions about your date and make it a two-way conversation. While it’s great to highlight your strengths, remember to ask questions about your client’s needs and expectations. 4. Be personal, not generic. Your date will soon realize when you’re going through your standard checklist of questions, so rather show some real interest in who you really are with individual questions. Don’t apply a cookie cutter approach to every client – not all clients have the same pain points and challenges. When creating a website, personalize and geotarget your website to the proper country’s domain. This will help retain web visitors and improve search engine results. For example, German-speaking websites should route to top-level domains (yourcompany.de) or sub-domains (de.yourcompany.com). 5. Mind your p’s and q’s. Dress appropriately for the occasion and choose an activity you both enjoy. If you’re going for a picnic in the park, don’t show up in a glitzy, cocktail dress and Jimmy Choos (your Jimmy Choos will surely sink in the grass with each step). Similarly, business etiquette differs regarding the situation. Educate yourself on the customs and etiquette of your destination country. How are dinner meetings conducted? Is gift giving considered polite or bribery? What are the verbal salutations and physical greetings? 6. Don’t be desperate. Don’t take on every project that is offered to you. Certain projects may not be worth your time or effort and taking these on will only demotivate you, causing you to underperform and under deliver. Be selective and make sure each project fits your team’s scope and interest – don’t take on projects just for the money. 7. Understand cultural differences. 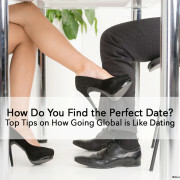 If you’re dating internationally, keep in mind any cultural differences and nuances. The term “dating” can be known by many different names. Clarify the difference between: attached, going out, seeing someone, hooking up. Consequently, a basic translation of your text is never the solution. You need to localize and take into account that certain phrases, pictures, and colors may not translate well or convey their symbolism in one country versus another. For example, the colors red, white and blue do not symbolize patriotism in Germany as they would in the US. 8. Make sure you’re ready. Just because you had a bad break-up, doesn’t necessarily mean that you’re ready to jump back into the dating pool. Take the time to focus on yourself first and then make the leap. Likewise, make sure you products are services are needed in that country and understand the competitive landscape. Don’t assume that just because your product does well in your country, everyone worldwide is in need of it. Regardless of your background or belief, relationships – business or personal – can be tricky, and adding international cultures to the mix can make it more confusing. If it’s a relationship worth having, it’s worth the time and effort. Do you have any fun stories or examples to compliment the list above? Add your comments in the section below.